On Monday night, French media giant Vivendi and NBC parent company General Electric agreed to terms that clear the way for US cable giant Comcast to take a controlling stake in NBC Universal. An announcement from Comcast is expected within days. The proposed merger would create a media behemoth, and clear the way for an unprecedented era of media consolidation across cable, the Internet and broadcast television. Be afraid. Comcast is both the largest cable company and the largest residential broadband provider in the United States: a $34-billion business with 24 million subscribers, reaching nearly one out of every four homes in the country. NBCU owns NBC, MSNBC, CNBC, Universal Studios, 27 television stations, and a host of other properties. President Obama has promised that his administration would finally begin enforcing antitrust laws to prevent unreasonable consolidation of market power. If ever a media deal posed such a threat, this is it. The merged Comcast would be to media what Goldman Sachs is to Wall Street: "a great vampire squid wrapped around the face of humanity, relentlessly jamming its blood funnel into anything that smells like money," as Rolling Stone's Matt Taibbi once described the latter. It should come as no surprise that Wall Street and Washington are saying this is already a done deal: The media and telecommunications industry is second only to drug companies in how much it spends lobbying Washington. Its army of PR firms, lobbyists and sock-puppet think tanks is already blitzing the press corps and Capitol Hill. It's readying Comcast CEO Brian Roberts for his close-up as a new media mogul and neglecting to mention the impact of this deal on everyday people. Comcast has raised cable rates for years while raking in record profits nearly every quarter. It is anti-union. It cares nothing for independent, alternative programming. And if you're a startup television channel, you can forget about getting a spot in Comcast's lineup. Comcast will charge you far more for space on its lineup than you could possibly pay. Just ask Al Gore about his failed effort to get his Current TV a reasonable position in the cable lineup. Let's not forget that Comcast is the company that was caught illegally blocking peer-to-peer Internet downloads and then lying about it - earning a smack-down from the FCC for breaking Net Neutrality rules. And the company is known for blocking TV ads it didn't like. The company's track record of protecting the public's interest isn't exactly stellar. And now, Comcast is set to control media across all distribution platforms. The company is threatened by the increasing amount of free content on the Net, and a public who is both watching entertainment on the Internet, and creating their own. NBC owns a major stake in Hulu, and Comcast likely wants to put the video service and all NBC content behind a paywall. Comcast and other cable companies are already putting the final touches on "TV Everywhere," a paywall that requires a traditional cable subscription to watch online content owned by these companies. Comcast's very survival depends on remaining the gatekeeper between you and the programs you want to watch, and it wants as little competition as possible. 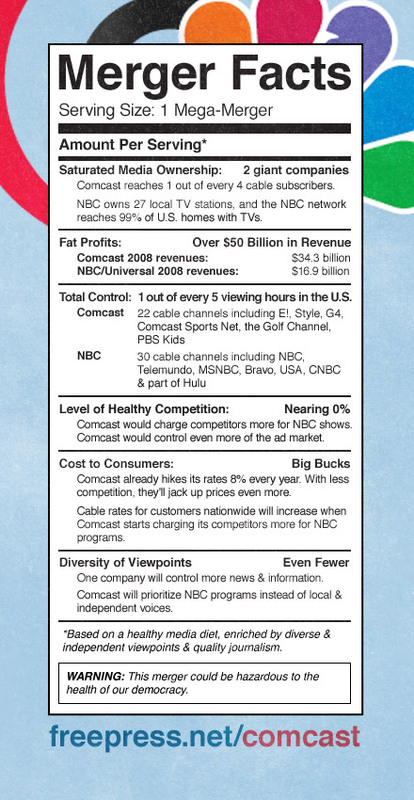 Worse still, if the Comcast-NBC merger is allowed to go through, it will be the start of a catastrophic storm: a tidal wave of mega-deals by other content giants like News Corp. and Disney merging with distribution behemoths like Time Warner Cable and AT&T. In a nation where 98 percent of Internet users have only one or two choices of Internet service providers, we could witness a future in which a handful of phone and cable companies, merged with a handful of content companies, will put all premium content behind a paywall and make all other content hard or impossible to find. ISPs' content and applications -- and those of their partner companies -- will move at light-speed, while the rest of the Internet will seem like it's still on dial-up. The result: homogenized corporate content, higher prices and fewer real alternatives so that distributors can prevent the "market fragmentation" that advertisers loathe. Sound familiar? The Internet will become the cable service of the 21st century -- instead of the free and open arena for economic innovation, democratic participation and free speech that it's been. Some say that companies like Comcast are simply doing what they must to prosper. But we need to ask whether boosting Comcast's bottom line is worth the cost to the rest of us. Such market power could destroy the promise of an open Internet and its unprecedented ability to amplify independent voices, reinvent journalism, and inspire new forms of entertainment. The deal is expected to take at least six months to finalize, and it will possibly be more than a year for federal regulators to approve or reject the deal. The warped Washington conventional wisdom says that the deal is inevitable, but Free Press and our allies are rallying public opposition. The Obama administration has sharply criticized the previous administration's weak antitrust record and promised vigorous oversight of anti-competitive deals -- particularly those involving vertical mergers (like joining content and distribution companies) and innovation-focused industries like the Internet. This merger is another major test of whether President Obama plans to deliver on his promises. Josh Silver is the director of Represent.us, dedicated to building a fiercely non-partisan movement to pass tough anti-corruption laws in cities and states across America, and end the legalized corruption that has come to define modern politics. Prior to that, Josh was the Executive Director of Free Press a national, nonpartisan organization that he co-founded with Robert McChesney and John Nichols in 2002 to engage citizens in media policy debates and create a more democratic and diverse media system.